Architectural art brings elegance and order to any room. Art that contains architectural elements is great for any setting because of the beauty and uniqueness it portrays. It provides a reasoned and orderly element to any space. I’m currently working on a piece that has an architectural background. It started me thinking about how architectural art has been used as a device to set off another subject, or used as the subject itself over the centuries. I’ve seen many architectural details drawn or painted as standalone pieces. When I was in High School in AP Art, I did a series of drawings of balustrades which helped me gain a 5 in the class. In paintings, buildings are often in the background which may be subordinate to the main subject — be they flora or fauna. But architectural art can go beyond supporting characters or used as a backdrop; it can also relay key messages and perform critical roles as well. For instance, in many depictions of the Annunciation during the Renaissance, entrances and thresholds were used to lure the viewer into the painting. The scene is often enhanced by architectural features such as steps, plinths, windows, and lofty archways — all of which provide structure to the painting as well as a sense of place. The architectural elements draws and directs the eye. Domenico Veneziano shows the Virgin and Child sitting on a throne that is deep and boxy and framed by an archway. This visually gives depth and at the same time frames the main subject. This construction also provides the scene with a reverential, lofty setting what with the tabernacle’s various architectural details and yet it also provides an urban feel. Architectural art isn’t limited to the classic scene. It can show a flight of fancy with structures that soar above and beyond the laws of physics. M.C Escher is famous for his ability to turn a building into an endless helix. In the way science fiction has showed us a world in the future, so too can architectural art foreshadow buildings that have not yet been constructed. Architectural art is used to set a calm mood in businesses and homes because the nature of architectural art is order and clean lines. Cityscape images and skyscrapers in a painting may provide focus on urban beauty or architectural ruins may show the decay of a civilization. 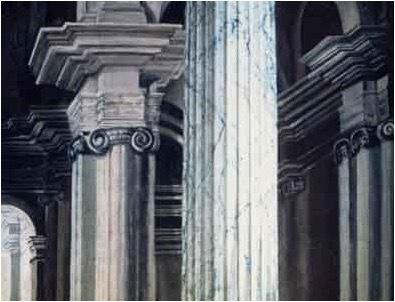 I’ve used architectural elements in many of my still life paintings. Most of them are from the Italianate Victorian house where I grew up. I love architectural detail. I studied Architecture at UC Berkeley for a time. Please like my Facebook Page or follow my Instagram to stay on top of my latest works. The next of which will have quite a bit of architectural detail from a Beaux Arts conservatory.